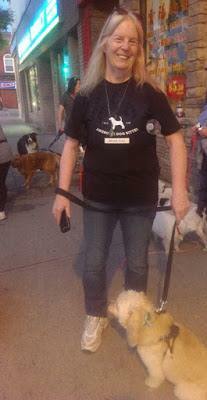 Meet Catherine Watt, owner of PupVacay, a professional pet sitter in the heart of Oshawa, Ontario! Offering an innovative and unique hands-on approach to small to medium doggie daycare and boarding (max 30 lbs/14 kg). 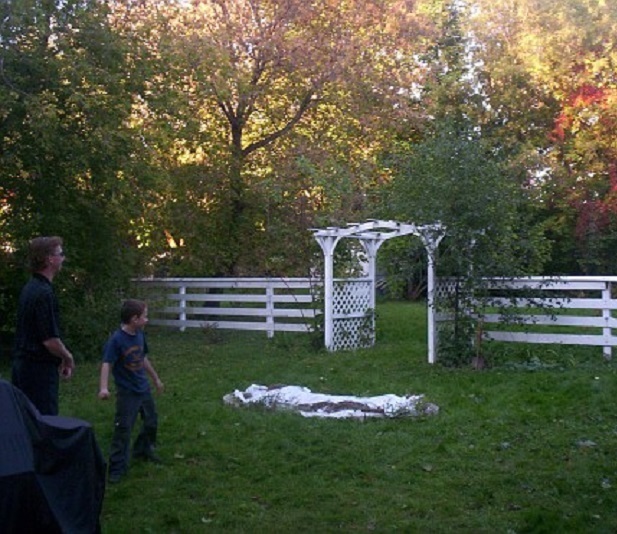 Pet First Aid/CPR certified ~ Insured ~ Bondable ~ Recent Police Check ~ Registered Business ~ 19 years dog care experience ~ 1/4 acre fully-fenced yard in the heart of Oshawa. 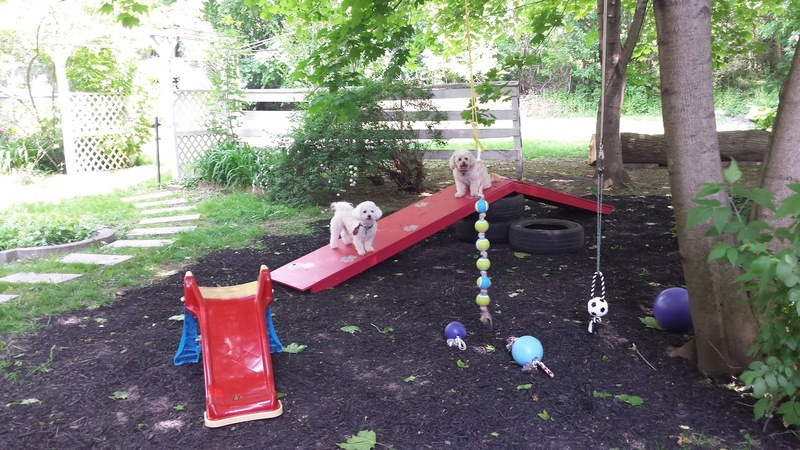 While PupVacay opened in March 2015, Catherine has been caring for dogs for 19 years, and has a beautiful quarter acre fully-fenced yard in the heart of Oshawa, covered in mature trees and bushes, for plenty of shade and room to run and play! Located just off Simcoe Street in Oshawa, with easy access to HWY 401. Your dog will be considered part of our family! 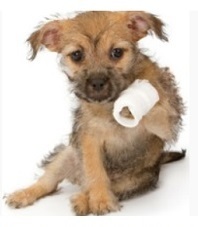 As owners of small breed dogs ourselves, we understand that these dogs require special attention. We will send pictures (sometimes even videos) to you every day, and you are welcome to call and "chat" on Skype! We provide 24/7 family-style care, the ultimate in quality care for your dog. Your dog's safety is our top priority - we have locking gates at the front door, and a two gate system into the play-yard! dished out all day long! Small doggy daycare and overnight boarding! I'd be happy to keep your dog entertained while you're away for the day, the week, or even for a month. Your dog will enjoy all the loving comforts and security of home, while following your usual routines to ensure joyful reunions and happy returns. Hammon - a tiny 3 month old Shitz/Maltese, while his family travels. He is a bundle of fun and constantly on the go! Beany - a tubby little Chihuahua who loves to join in the fun when his family goes on holidays! 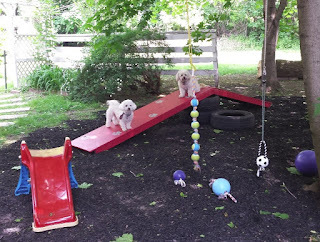 Lea and Luigi - two adorable little Bichons who considered themselves a part of our pack when they walked in the door - when their owners traveled across Canada! 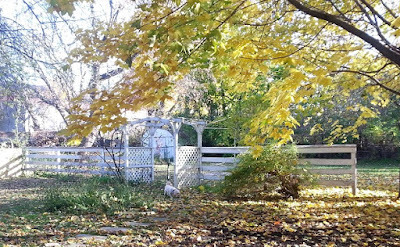 The dogs love running around our beautiful quarter acre backyard (herbicide & pesticide-free), totally fenced in and lots of shade, mature trees to check out and bushes to hide behind - leash-free! And check out our new doggie play area!! Your dog will have free reign on the first level of our pet-friendly home, with plenty of dog-safe toys to play with and couches to rest on, in air-conditioned or heated comfort. In the evening we all cuddle on the couch while watching TV, and your dog will sleep in our room when staying overnight. We have double gates at the front and back door - your dog's safety is our first priority! We have regular feeding and treat times. You may bring your own treats, or we can provide American-made single ingredient liver treats. Dogs are fed separately to prevent bowl-sharing, with access to plenty of filtered water to drink whenever they need. We go out to play in our big backyard at least every couple of hours, or as needed. Puppies (yes, we accept puppies!) can be taken out every hour, but must be able to make it thru the night. 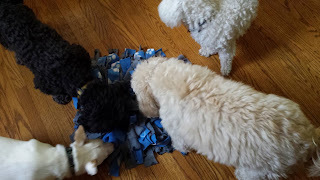 I have experience with dogs going blind, and incontinent, needing a belly band and seizures. I have experience with rescues, dogs from loving homes, and dogs abandoned to the streets and abused. I have taken care of dogs that are considered too whiny or clingy for other sitters, with separation anxiety - who have been wonderful with me. We will send you pics of how much fun your pet is having every day! You provide your dog's food and leash (kennel, if normally used at home), and we provide the cuddles, belly rubs, games of fetch and FUN!! We look forward to meeting you and your little buddy! Boarding: Cost starts at $40 for 24 hours perdog. If pick-up will be later than 24 hours, there will be an additional cost at daycare rates, shown below.